1) Joan Miro's artwork was inspire by Cezanne and van Gogh, and he felt drawn to the Cubist and Surrealist artists who were working in Paris. 2) In the early 1920s, Miro traveled to Paris and it was there that he met, and was inspired by, Pablo Picasso and many other famous artists. 3) Miro's influence on the art of the later 20th century is great; some artists who were influenced by him include Robert Motherwell, Arshile Gorky, Jackson Pollock, Roberto Matta, Mark Rothko. 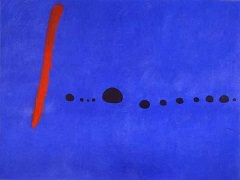 4) In 1974, Joan Miro produced a tapestry for the World Trade Center. It was one of the most valuable pieces of artwork destroyed in the September 11 terrorist attacks. 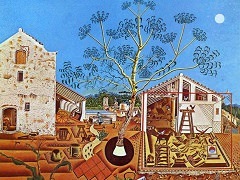 5) Earnest Hemingway purchased the Miro's The Farm as a birthday gift for his wife, paying 5,000 francs at the time. Today, it can be viewed at the National Gallery of Art in Washington, D.C.
6) Miro' and his contemporaries were encouraged by Sigmund Freud theories to make extensive experiments in deliberately suspending conscious control in order to release an unhindered flow of unconscious thought. They actually influenced states of hallucination, risking madness in order to capture the shapes and figures on paper during these states. 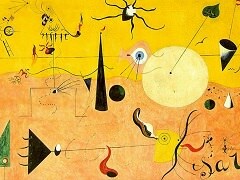 Miro' induced these hallucinations by hunger, exhaustion, or even exaltation. 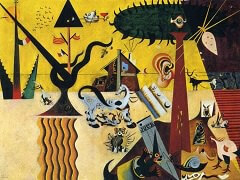 Miro' also revealed that reading surrealist poetry helped to bring on a hallucinatory state. 7) Henri Matisse's son, the gallery-owner Pierre Matisse, was a big champion of Miro's work. 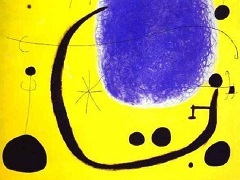 He exhibited Miro's paintings in the United States. 8) The Tilled Field, 1924 marked the turning point in Miro's art toward a personal style. 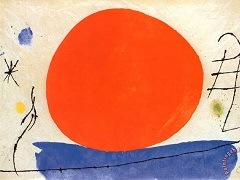 The change in his art was furthered by his encounter with the works of Paul Klee and Wassily Kandinsky. 9) In 1926, Miro collaborated with Max Ernst on a production of "Romeo and Juliet" by Sergei Diaghilev's Ballets Russes - an accommodation to haut bourgeois taste that provoked Andre Breton and the poet Louis Aragon to denounce both artists for having "abandoned their class." 10) In June 2012, Miro's painting Blue Star, 1927 was sold at auction for £23.5 million, setting a new record for the highest price paid for a painting by Joan Miro.